Kurochan's car could almost be a tale of two cars. 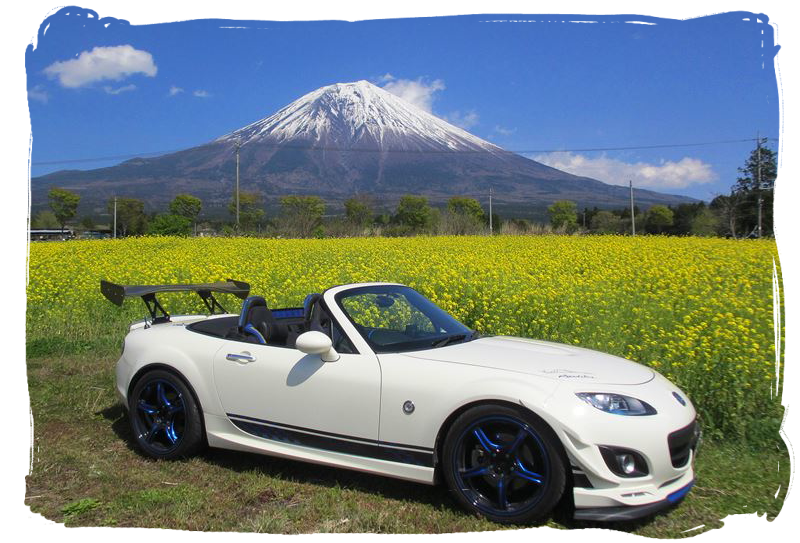 Starting life as a white NC2 soft top model that was heavily modified in an extravagant style. 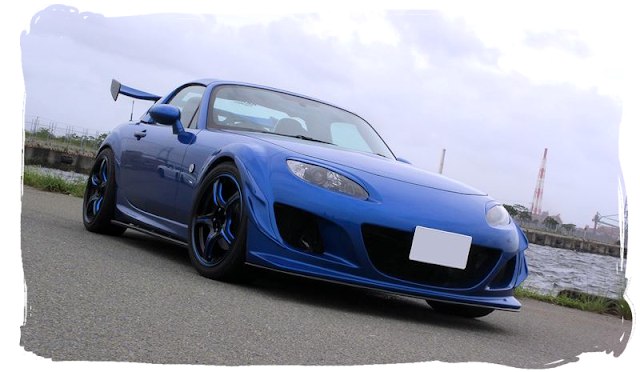 It featured 18" Yokohama AVS T5 wheels (as seen on the Mazdaspeed concept), Mazda optional aero parts, a large GT rear wing, and several custom parts such as the front air splitter and vinyl graphics. Recently though this car has undergone a dramatic makeover. Starting with the obvious, the car has been given a complete respray in stunning Subaru WR Blue. 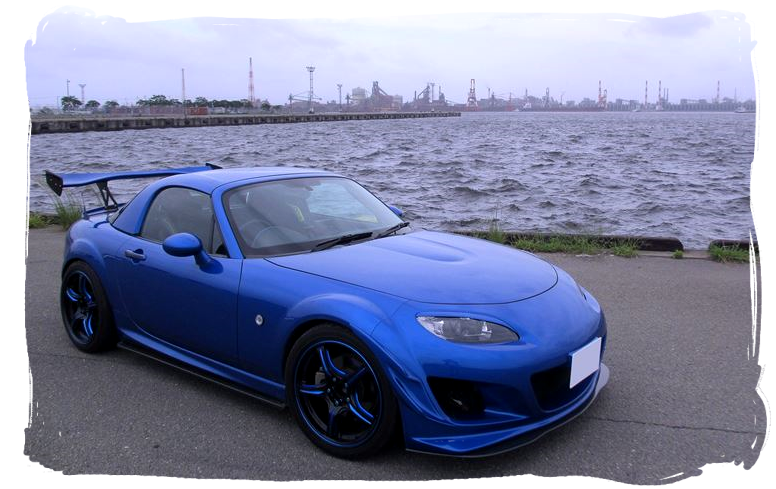 Mazda's detachable hardtop was fitted along with many premium aftermarket parts. The most striking of which is the new AutoExe front bumper with its large vents and swooping curves. 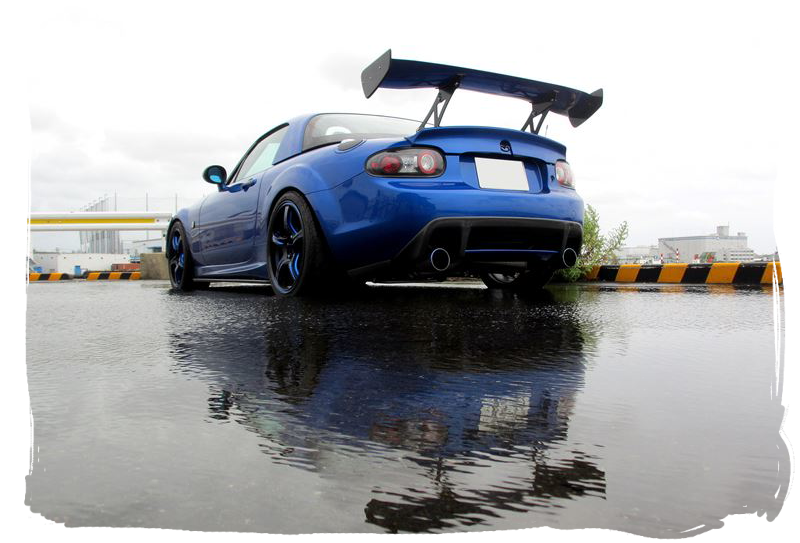 Large Jet's Master Spec front canards by Integral Kobe are attached at each side to help direct air around the car. An air splitter piece by Garage Vary is mounted under the bumper's lip. The headlights have been swapped for the 2013 NC3 soft top black versions and are finished with Garage Vary trim pieces. The sideskirts here are the NC2 optional Mazda parts with an added carbon lip to the underside that complements the GV front piece nicely. 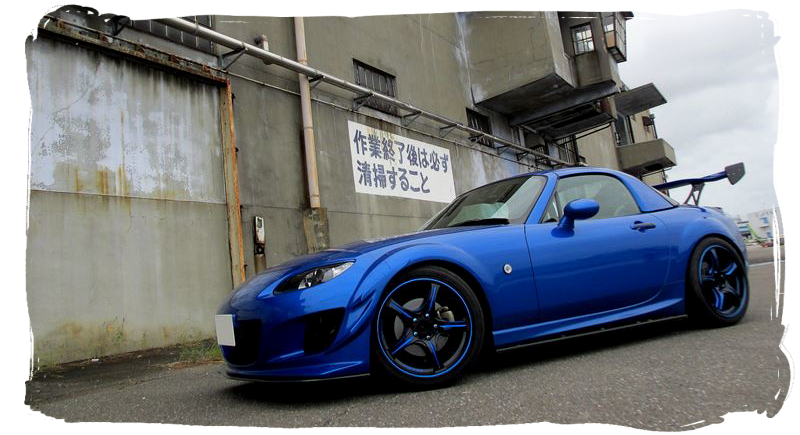 The wheels are WedsSport SA-50M in a black/blue finish costing in the region of $600 each. No wonder then, they are secured with Kyo-Ei forged steel anti-theft wheelnuts with durable blue coating. The rear of the car is fitted with a Nopro ducktail spoiler, a Garage Vary rear bumper, customised NC black tail lights with added LEDs, and a dramatic Sard GT wing. As for performance modifications, this car has AutoExe adjustable coilovers, front and rear RX-8 stabilizer bars, Nopro droplinks, AutoExe muffler, AutoExe airbox with K&N panel filter, Endless brake pads, and a Nopro silicon intake elbow. The interior continues the blue/black theme with Recaro seats from the Mitsubishi EVO VI as well as Artworks/Dewa gauge faces and various accent trim pieces from Sheonme.